Mouse anti Human HLA-G antibody, clone MEM-G/9 (MCA2044) used for the evaluation of HLA-G expression on transfected cells by flow cytometry. MiR-148a and miR-152 down-regulate HLA-G expression and reduce LILRB1 binding. 721.221/HLA-G (G variant, A, or C variant, B) were transduced with the control miRNA, miR-148a or miR-152. The various cells were then stained with anti HLA-G mAb and analyzed by FACS. One out of three representative experiments is shown. (C) FACS histograms re HLA-G staining of 721.221/HLA-G cells not expressing the 3′UTR of HLA-G. One out of three representative experiments is shown. (D–E) LILRB1-Ig staining of 721.221/HLA-G (G variant, D, or C variant, E) and of 21.221/HLA-G cells not expressing the 3′UTR of HLA-G (F) transduced with control miRNA, with miR-148a or with miR-152. Black histogram: cells transduced with a control miRNA. Dark grey histogram: cells transduced with miR-148a. Light grey histogram: cells transduced with miR-152. One out of three representative experiments is shown. (G) Quantitative real-time PCR analysis of HLA-G mRNA levels in 721.221/HLA-G cells (G variant), presented relative to hUBC. One out of three representative experiments is shown. MiRNA-Mediated Control of HLA-G Expression and Function. Mouse anti HLA-G antibody, clone MEM-G/9 (MCA2044) used for the evaluation of cuirculating HLA-G in Primary Antiphospholipid Syndrome and control patients by ELISA. HLA-G serum levels in 44 PAPS patients and 43 healthy controls, and in PAPS patients with and without heparin. From: de Carvalho JF, de Oliveira RM, Rodrigues CE, Glezer A, Bonfá E, Pereira RM. 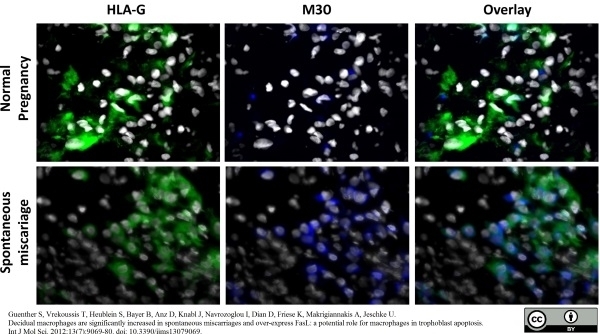 Dual immunofluorescence using HLA-G (an extravillous trophoblast marker) and anti-M30 cytodeath reveals that trophoblast apoptosis is markedly increased in spontaneous abortions. From: Guenther S, Vrekoussis T, Heublein S, Bayer B, Anz D, Knabl J, Navrozoglou I, Dian D, Friese K, Makrigiannakis A, Jeschke U.
Decidual macrophages are significantly increased in spontaneous miscarriages and over-express FasL: a potential role for macrophages in trophoblast apoptosis. Int J Mol Sci. 2012;13(7):9069-80. FITC conjugated Mouse anti Human HLA-G antibody, clone MEM-G/9 (MCA2044F) used for the identification of HLA-G expressing trophoblast cells by flow cytometry. The IL-2 receptor β subunit is up-regulated on trophoblast cells as they differentiate from villous to extravillous phenotype. Upregulation of IL-2Rβ expression was validated by flow cytometry (A–C) and immunohistochemistry (D). Preparations of placental cells from normal first trimester pregnancies were gated on scatter, leukocytes excluded by CD45 labelling (gate R2) and subunits of the IL-15 receptor complex stained on villous (EGF-R+) or extravillous (HLA-G+) trophoblast cells (A). Dot plots are shown of IL-2Rβ subunit staining villous (B) and extravillous trophoblast (C). Shown here are cells from the same placenta which is representative of 3 pregnancies analysed. The IL-2Rβ was also localised histologically in sections of implantation site from the first trimester (D). The low power plan stained with cytokeratin shows villous mesenchyme (top left) and a column of EVT (bottom right) developing from placental villi (centre). Higher power pictures show strong IL-2Rβ staining detected on extravillous trophoblast migrating away from the villi, whereas staining was negligible on villous trophoblast and villous mesenchymal cells. From: Apps R, Sharkey A, Gardner L, Male V, Trotter M, Miller N, North R, Founds S, Moffett A. Genome-wide expression profile of first trimester villous and extravillous human trophoblast cells. Mouse anti Human HLA G antibody, clone MEM-G/9 recognizes human HLA-G, a non-classical major histocompatibility complex (MHC) molecule. HLA-G expression is restricted to trophoblast cells and some medullary thymic epithelial cells. Several isoforms of the HLA-G molecule exist, which include the membrane bound isoforms HLA-G1 – G4 and soluble isoforms HLA-G5 – G7. Clone MEM-G/9 specifically recognizes surface expressed native HLA-G1, when associated with beta 2 microglobulin, but not does recognize the isoforms HLA-G2, G3 and G4. CMouse anti Human HLA G antibody, clone MEM-G/9 has also been reported to recognize the soluble isoform HLA-G5. Recombinant human HLA-G refolded with beta 2 microglobulin. Spleen cells from immunised Balb/c mice were fused with myeloma cells. Fournel, S. et al. (2000) Comparative reactivity of different HLA-G monoclonal antibodies to soluble HLA-G molecules. Tissue Antigens. 55 (6): 510-8. Menier, C. et al. (2003) Characterization of monoclonal antibodies recognizing HLA-G or HLA-E: new tools to analyze the expression of nonclassical HLA class I molecules. Hum Immunol. 64 (3): 315-26. Kotze, D.J. et al. (2010) Embryo selection criteria based on morphology VERSUS the expression of a biochemical marker (sHLA-G) and a graduated embryo score: prediction of pregnancy outcome. J Assist Reprod Genet. 27 (6): 309-16. Guetta, E. et al (2005) Trophoblasts isolated from the maternal circulation: in vitro expansion and potential application in non-invasive prenatal diagnosis. J Histochem Cytochem. 53: 337-9. J Clin Invest. 120: 4102-10. Sher, G. et al. (2005) Influence of early ICSI-derived embryo sHLA-G expression on pregnancy and implantation rates: a prospective study. Sher, G. et al. (2005) Soluble human leukocyte antigen G expression in phase I culture media at 46 hours after fertilization predicts pregnancy and implantation from day 3 embryo transfer. Apps, R. et al. (2011) Ex vivo functional responses to HLA-G differ between blood and decidual NK cells. Mol Hum Reprod. 17: 577-86. Manaster, I. et al. 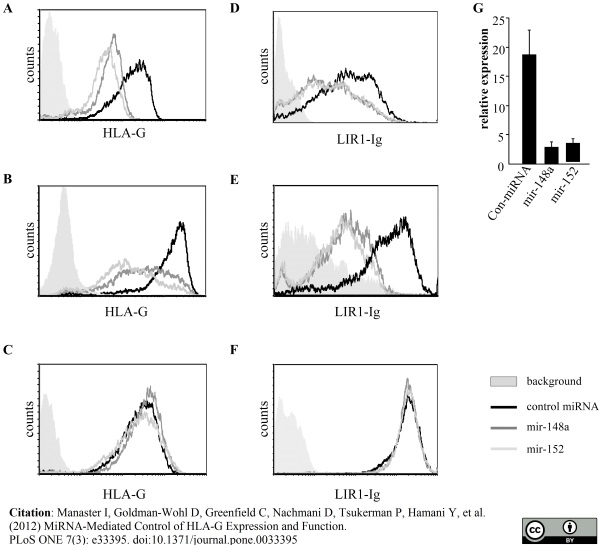 (2012) MiRNA-mediated control of HLA-G expression and function. Nückel, H. et al. (2005) HLA-G expression is associated with an unfavorable outcome and immunodeficiency in chronic lymphocytic leukemia. Yao, Y.Q. et al. (2005) Differential expression of alternatively spliced transcripts of HLA-G in human preimplantation embryos and inner cell masses. J Immunol. 175 (12): 8379-85.
de Carvalho, J.F. et al. 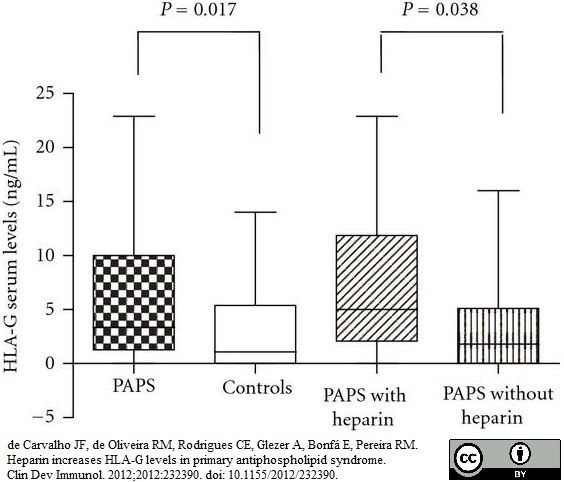 (2012) Heparin increases HLA-G levels in primary antiphospholipid syndrome. Clin Dev Immunol. 2012: 232390. Guenther, S. et al. 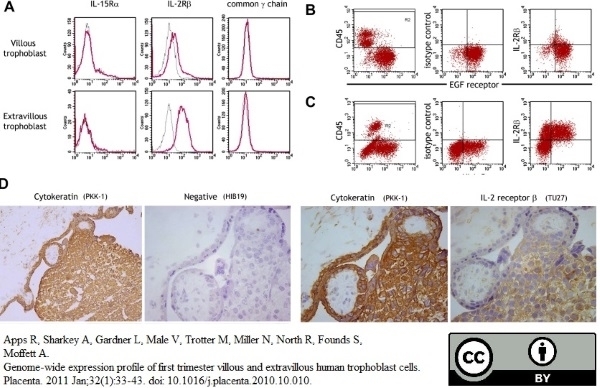 (2012) Decidual macrophages are significantly increased in spontaneous miscarriages and over-express FasL: a potential role for macrophages in trophoblast apoptosis. Int J Mol Sci. 13 (7): 9069-80. Apps, R. et al. (2011) Genome-wide expression profile of first trimester villous and extravillous human trophoblast cells. Lim DS et al. (2014) The combination of type I IFN, TNF-α, and cell surface receptor engagement with dendritic cells enables NK cells to overcome immune evasion by dengue virus. J Immunol. 193 (10): 5065-75. Reches, A. et al. (2016) HNRNPR Regulates the Expression of Classical and Nonclassical MHC Class I Proteins. J Immunol. 196 (12): 4967-76. Sensors and Actuators B: Chemical. 165 (1): 1-6.